Razer was showing off two new items at CES, one was evolutionary but SemiAccurate feels the other could be revolutionary. Evolution brings us the Turret keyboard and mouse, revolution lurks in their VR headset plans. Lets start out with the expected, the Turret keyboard plus mousepad combo. Take a nice laptop style low-profile keyboard and put a mousepad where the 10-key numeric keypad should be. Actually enlarge it to about half the length of the keyboard itself and you have a slick place to use your mouse when running your HTPC. It wouldn’t be a Razer product without green backlighting and sure enough the Turret has that. It also wouldn’t be Razer without some neat tricks like the mousepad folding neatly back to keep the entire keyboard flat when it is in the charging dock/stand. That isn’t the good part though, the mousepad is lightly magnetized so the mouse stays put on it when you tilt the keyboard, no more flying rodents on movie night. It works a lot better than we expected it to, more than enough to put a Turret on the short list when the current Logitech HTPC keyboard dies in the SemiAccurate man-cave. The Turret stand/charger/controller will also support up to four of their Serval wireless gamepads. For some strange reason, Razer also recommends that you pair a Turret with their Forge TV Android set top box. Like all of its ilk, Forge TV is a small squareish black box with a big Razer logo on the top, about what you would expect. Under the hood there is a Qualcomm snapdragon 805 SoC running at 2.5GHz with 2GB of RAM and 16GB flash, not bad for $99. This should be more than powerful enough to run any games meant for phones and tablets, plus it uses Android 5.0 Lollipop for an OS. The only down side is that the 805 is still 32-bit but we expect an updated version sometime this year. Stepping out of the ordinary we have something that both surprised and impressed us, Razer’s OSVR. That stands for Open Source VR and they really mean it, everything about this VR headset is open. That means you can download the code for the headset here, the plugins for Unreal Engine, Unity, and Oculus here, and even the schematics for the headset down to the level of the CAD files are open. You can request a copy of the current (v.5 at the moment) schematics here to 3D print your own. The initial prototypes SemiAccurate used at CES ran at a full 60Hz with ~16ms of latency, not bad at all and better than many commercial products we have used. 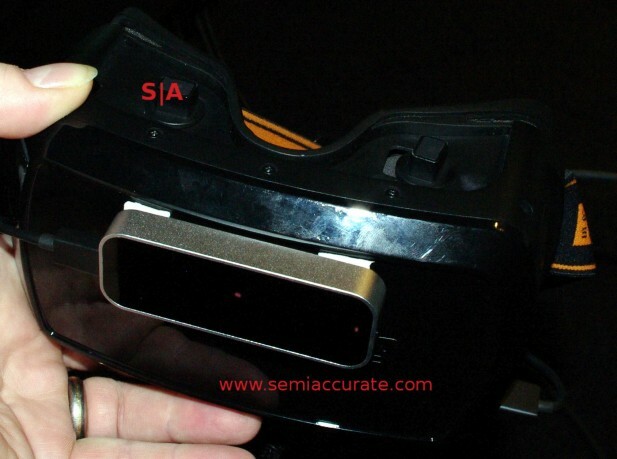 Screens are 1080p, split between two eyes obviously, and the prototype used an OLED panel. Other panels are under consideration and if you have a better idea you can add it yourself, remember this is really an open system and specs. On the front there is a Leap Motion IR camera for tracking hands to use as a controller, about the best you can expect without blowing out the price tag by several orders of magnitude. 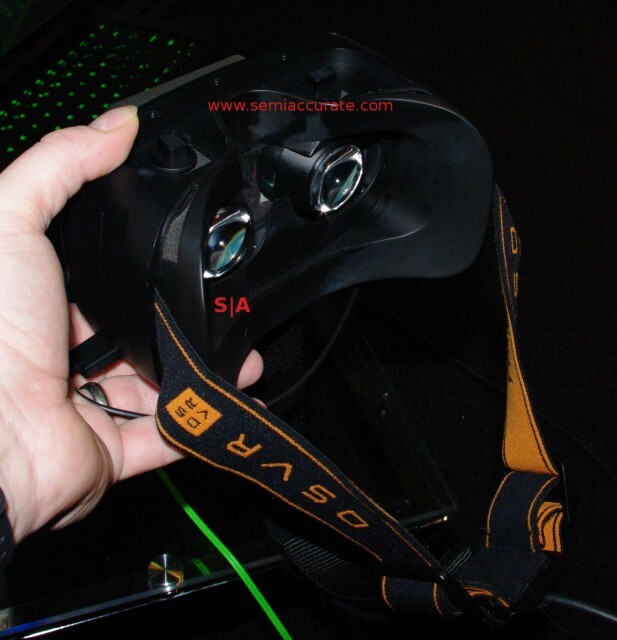 All the openness in the world is useless if the initial product isn’t any good so how does the Razer OSVR headset do in the real world? In short pretty well, the one performance note we scribbled down in our notebook was, “no lag L/R” because there really wasn’t. Hand/motion tracking was pretty solid, that is to say it worked where a lot of others SemiAccurate tried didn’t or used a wired controller. About the best compliment I can give OSVR is that the Oculus Rifts I tried made me feel a little queasy in fairly short order, the OSVR unit didn’t after a much longer time. It is pretty solid. If you want a pre-built OSVR rig you can order one in HDK form for a mere $199 here but they won’t ship until June. Even with a few months wait it is a damn good deal made all the better because it is open, hackable, and easy to work with. Everything is licensed under Apache 2.0 and a version of Google’s Project Aura MDK, both very permissive licenses. OSVR is a really complete system with all the right plugins and features, it is very well done.